San Francisco's Academy of Art University has a fine collection of classic cars available for study by its design students. They shared the collection at the 2010 San Francisco International Auto Show. 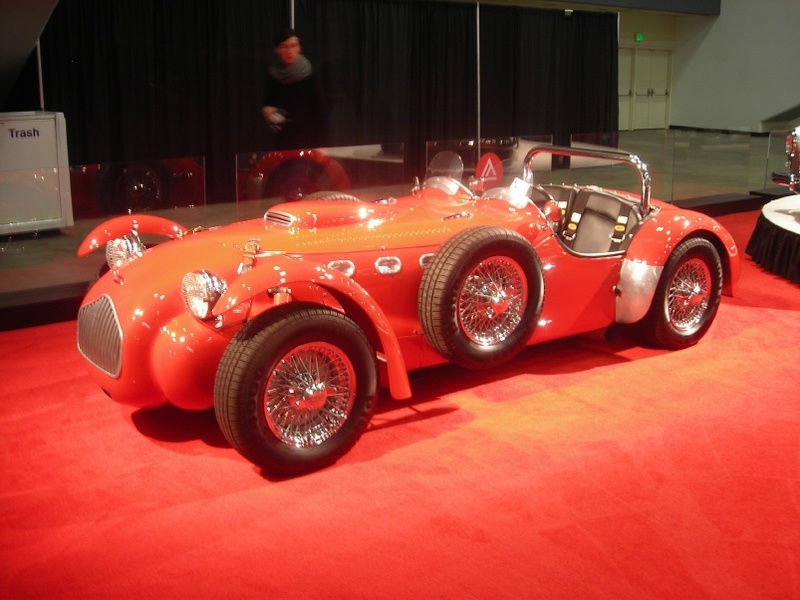 After World War II, the British economy was in bad shape, so Sydney Allard designed a roadster to appeal to the American market. The light, agile J2 proved to be very popular in both the US and Europe. Using a variety of engines, they did well in competition. It looks like a fun ride. DSCN6395.JPG. I'm sad that Caesar's Italian Restaurant, a San Francisco institution, is closing Friday. We have celebrated many family events there. I remember the seven course dinners. If you are looking for something to do this Labor Day weekend, I can recommend the Twelfth Annual Washington Township Railroad Fair at Ardenwood Historic Farm Regional Park in Fremont. Every year, the Society for the Preservation of Carter Railroad Resources brings in a steam locomotive to replace their regular horse-drawn rail operation. There are rides on steam-drawn trains and handcars. There is a large garden railroad display, and all the regular animals and farm equipment and the beautiful Patterson house. 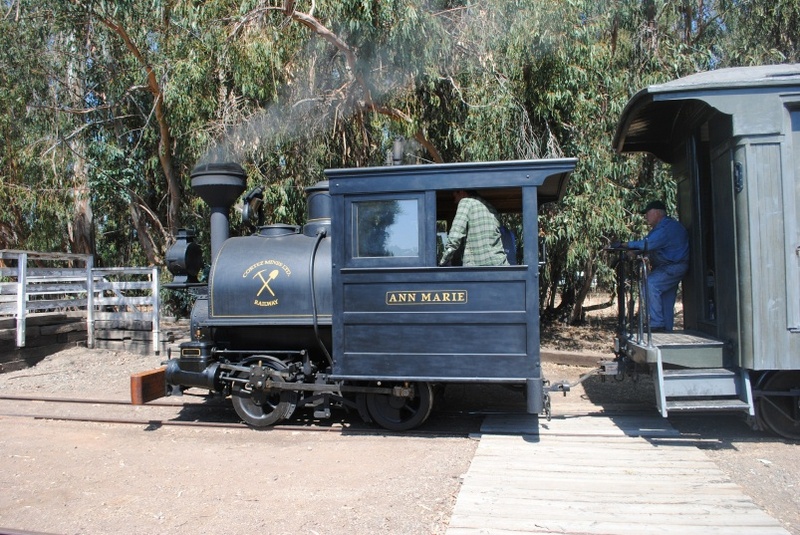 Visiting for the third straight year is Ann Marie, an 1890 Porter 0-4-0T, Cortez Mining Company 1. It is well worth a visit. This year the Dumbarton Bridge will be closed for retrofitting over Labor Day weekend, so those of us coming from the west will look for an alternate route. . I took this photo of Ann Marie on Labor Day Weekend, 2011. 10-4, September 1, 2, 3. I was inspired by the recent America's Cup World Series, held in San Francisco Bay, to include a beautiful image of a yacht. The Corinthian Yacht Club of San Francisco is still operating, based in Tiburon. The Encinal Yacht Club is based in Alameda. Aeolus, named after the Greek god of the winds, was nominated to race an Encinal Club yacht for the San Francisco challenge cup, which I believe is still contested. The Corinthians Will Hold Their Opening To- Day. Corinthians : On Saturday, April 24, we will welcome our season of '97 with the customary Corinthian festivities. 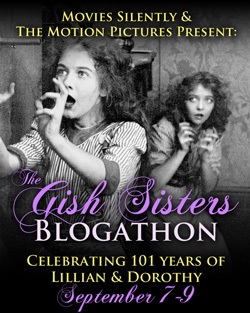 The clubhouse will be opened early for the reception of our lady friends and their escorts. Refreshments will be served during the afternoon, and the time passed with music and dancing until the departure of our guests on the boat leaving at 5 :40 P. M Owners are requested to have their yachts dressed for the occasion. Those unable to attend to this personally may leave their flags with the steward, who will set them. As a prelude to the "jinks" a feast will be provided immediately after the arrival of the 6:30 P. M. boat from the City. An elaborate programme has been prepared for the evening by a committee which has never failed to please the fastidious Corinthian. Owing to the limited accommodation of our clubhouse, this entertainment will be only for members and specially invited guests. For the occasion the San Francisco and North Pacific Railroad Company has kindly consented to accommodate those who are obliged to return to the City. The boat will leave Tiburon about midnight. Regular tickets will be accepted on this boat. Three whistles will be blown as a signal five minutes before starting. Orders, Sunday, April 25—8 A. M., colors; 9:30 A. M., captains will report on board flagship for orders; 10:30 A. M., leave moorings at signal from the commodore for squadron cruise in two divisions; all yachts over thirty feet waterline length will follow the flagship Clara; the remainder of the fleet will follow the vice-commodore in the Aeolus. A committee will be in attendance to arrange for the accommodation of non-yacht owners on the yachts of members. Reception committee— Commodore Alex J. Young, Vice-Commodore Carl Westerfeld, E. B. Lathrop C. L. Barrett, J. H. Keefe, F. R. Cook and W. F. Fisher; floor committee— J. M. Mattoon, J. Short Jr., Robert Dean, R. H. Morrow and F. M. Thornton; floor manager, E. S. Emmons; Jinks committee— M. A. Newell, J. V. O'Brien, F. M. Thornton, W. H. Crowell, D. H. McLaughlin and O. Ellinghouse. The Aeolus has been chosen by the Corinthian Yacht Club to compete for the San Francisco challenge cup now held by the Encinals. A formal challenge was sent to the Encinals a few days ago and the probability is that the latter club will accept. It is expected that the Fawn will be chosen, and as both yachts are in the same class a great race should be the result. The Aeolus is owned by genial Bob Morrow and Vice-Commodore Westerfeld. She was designed by Leonard and built by Frank Stone. The Aeolus has shown great speed, and in the last regatta made an excellent showing against ex-Commodore Pew's yacht Truant. J. R. Savory's yacht Juanita is on the beach having her bottom painted and interior renovated and will go in commission to-morrow. I took the photo on 25-August-2012. 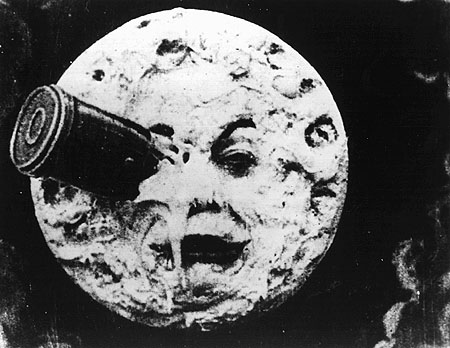 I was sad to learn that Astronaut Neil Armstrong has died. He was an Ohioan, a Naval aviator, a Korean War veteran, and the first man to walk on the Moon. We gathered at our house to watch and my mom made a cake that looked like the Moon. Today we went to a nice picnic at San Pedro Valley Park. 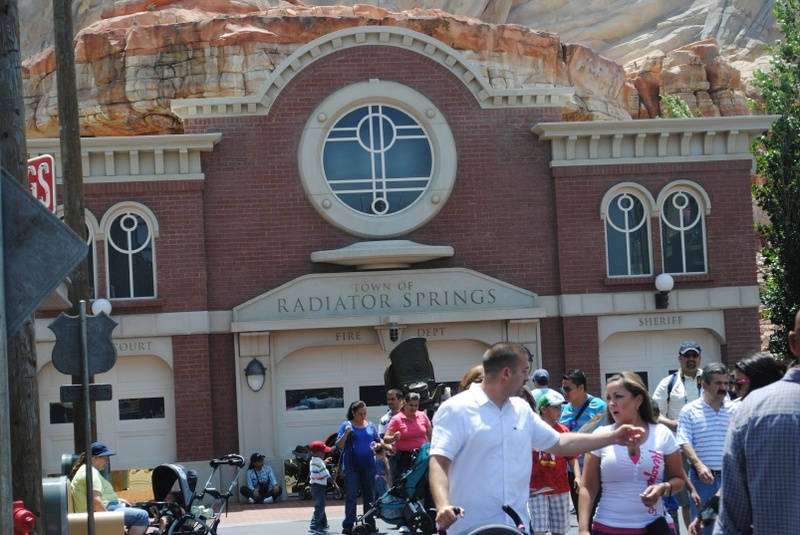 The town of Radiator Springs is the center of the new Cars Land in Disney California Adventure. I liked this sign, with the ghost of at least one other showing behind it. Today is Gene Kelly's 100th birthday. I remember reading somewhere that he went to dance school because it was a good place to meet girls. It worked. 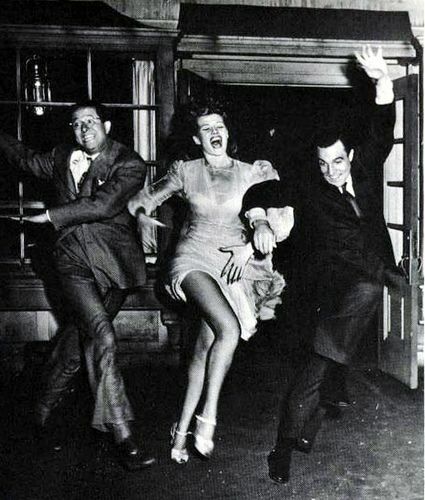 Here he dances with Phil Silvers and Rita Hayworth in the concluding scene of Cover Girl. I was sad to learn that Joe Kubert died earlier this month. I always enjoyed his work in Our Army at War and other war comics. 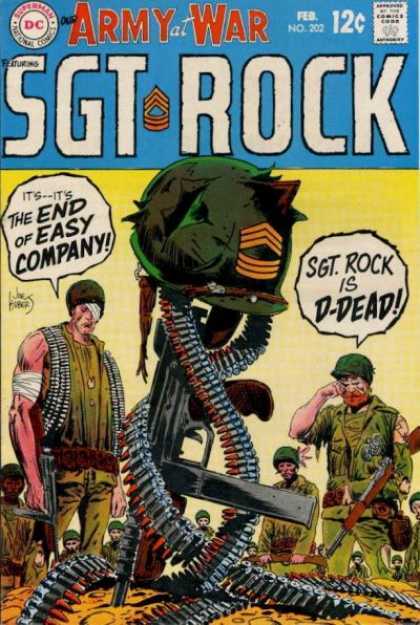 Many people considered Sgt Rock and Easy Company to be a cheap imitation of Marvel's Sgt Fury and His Howling Commandos, but I liked the real human qualities of Sgt Rock. I never liked Hawkman as a character, but Kubert did some wonderful drawings for the covers and the stories. 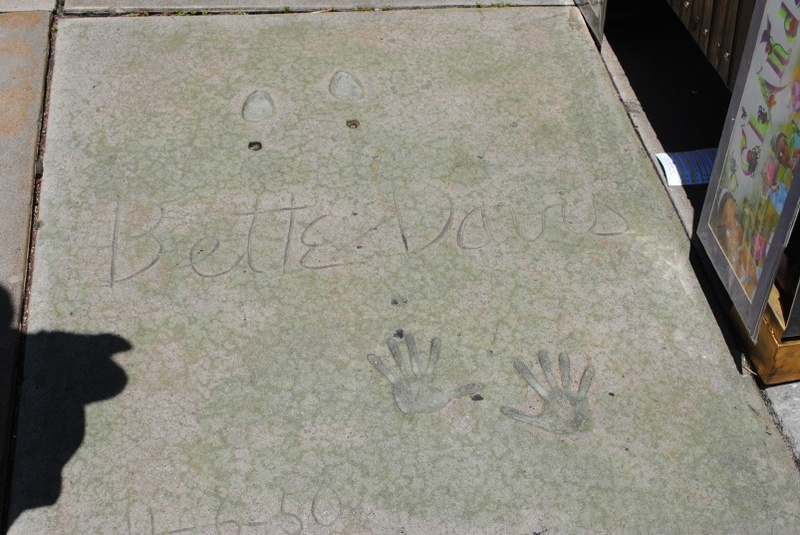 Actress Bette Davis left her hand and footprints on this slab on 06-November-1950 (DSC_0027). I wonder if she was promoting All About Eve. Railroad Man's Magazine went through many names, including Railroad Stories, and wound up as Railfan and Railroad. I have a subscription to Railfan and Railroad. 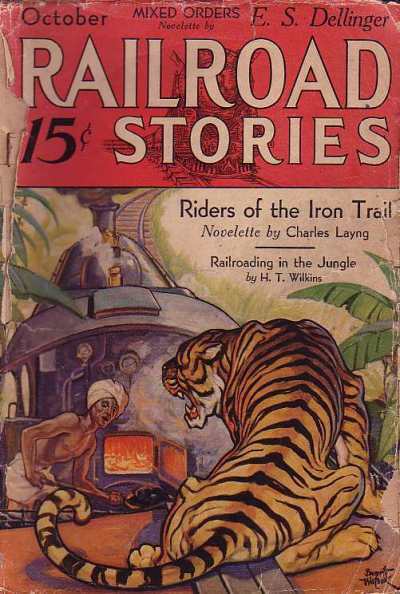 The October, 1932 issue of Railroad Stories featured a tiger and a locomotive fireman who is about to file a worker's comp claim. Before there was Laurel and Hardy, there was Plump and Runt. 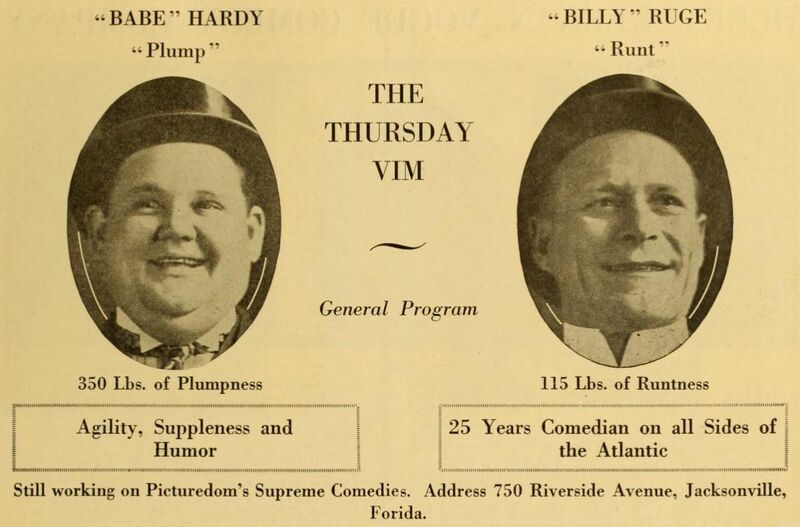 Oliver Hardy ("350 Lbs of Plumpness/Agility, Suppleness and Humor") teamed with Billy Ruge ("115 Lbs of Runtness/25 Years Comedian on all Sides of the Atlantic") in a series of comedies produced by the Vim Comedy Company in Jacksonville, Florida. Without his mustache, Oliver Hardy resembled Dom DeLuise. 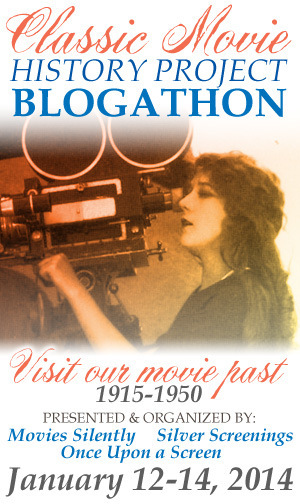 The image is from the 1916 Motion Picture Studio and Trade Annual. We went downtown this morning. After a visit to Macy's, we had lunch at the Irish Bank. We went though the Crocker Galleria and the Palace Hotel, and then went on to the California Historical Society. "A Wild Flight of the Imagination" is their exhibit for the 75th birthday of the Golden Gate Bridge. The exhibit gives credit to Irving Morrow for his vision of the bridge's potential beauty. In part it does this by showing Joseph Strauss' original concept. The first gallery shows the Golden Gate before the bridge was built. I have seen many pictures of the Gate before the bridge, and I always find them jarring. The second gallery described ferry service before the bridge. It described the capacity problems as autos became more popular. The next gallery talked about the effects of the Depression and the start of construction. The main gallery had nice large drawings and paintings by John Eberson and the Morrows (Irving and Gertrude). My wife was amazed at the plans for the Toll Plaza and triumphal colonnade. I was amazed by the plan for the approach road that showed it passing through the rotunda of the Palace of Fine Arts. We stopped at the Metreon and had cupcakes, then headed home. I miss taking the bus along the 280 Extension. We went to mass at 5 o'clock. Cable Car Clothiers is having a moving sale. 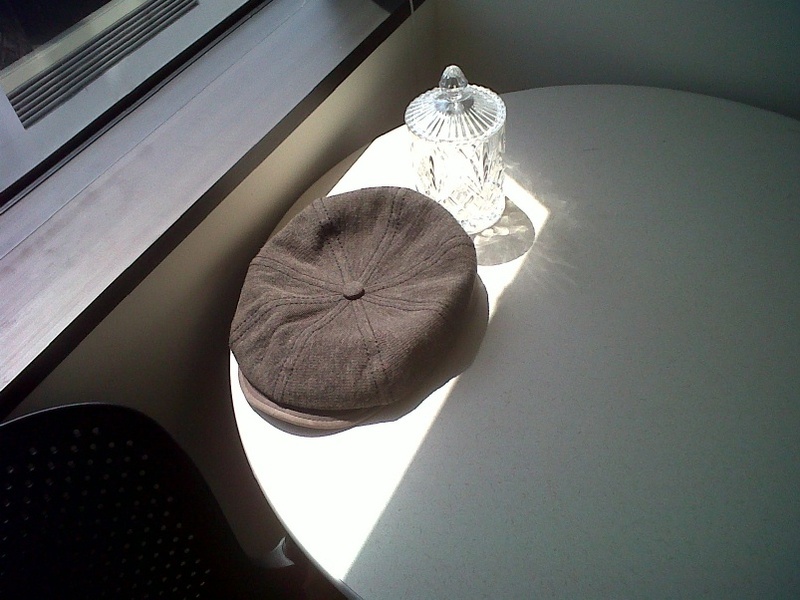 I bought a nice cap today for 30% off. They are going back to Sutter Street. 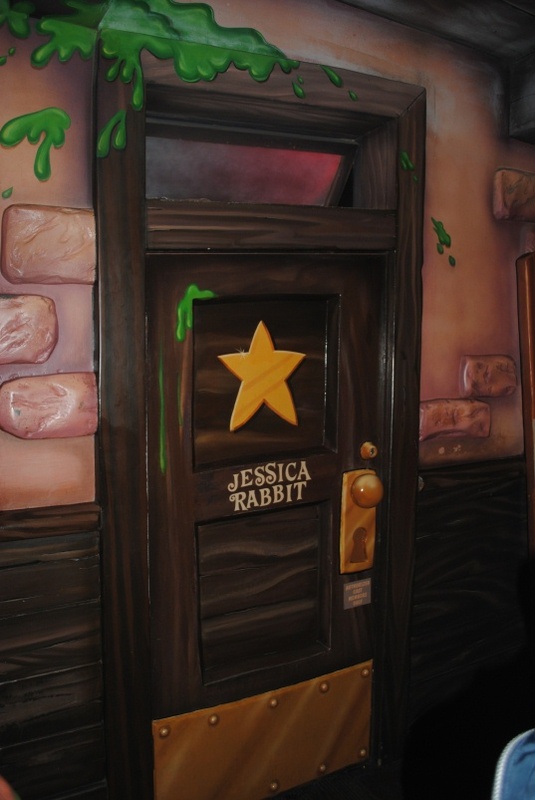 On our recent trip to Disneyland, we got stuck in the Roger Rabbit queue for an hour or more I had time to take some photos, like this one showing the door to Jessica Rabbit's dressing room. I was sad to learn that the Giants' most consistent hitter, Melky Cabrera, failed a test for steroids and will be suspended for 50 games. 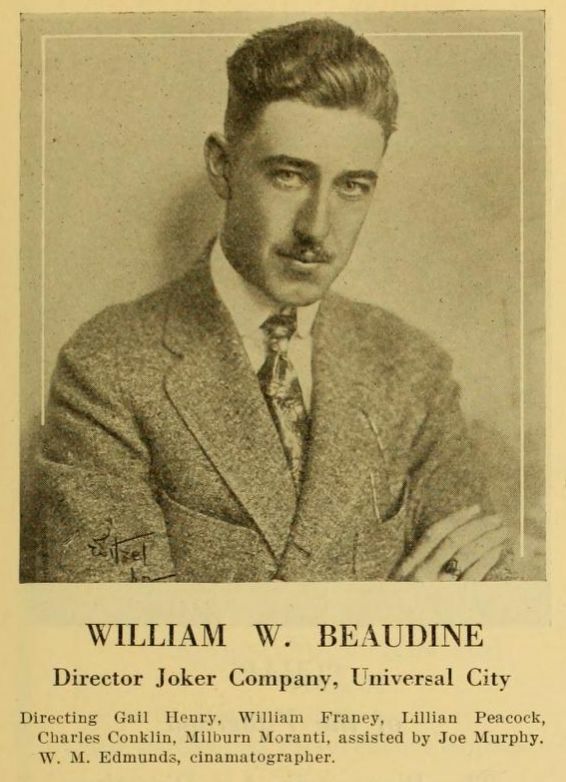 William Beaudine began directing in 1915 and continued directing until 1966. I suspect that no one knows how many shorts, features and television shows he directed. Michael Medved and the other authors of The 50 Worst Films of All Time gave him the nickname "One Shot" because he was rumored to avoid retakes. This is not true. He did retakes when they were needed. I have not noticed flubbed lines in his films that I have seen. The image is from the 1916 Motion Picture Studio and Trade Annual. 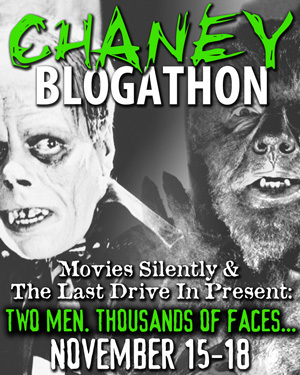 "...transferred direct FROM BRAIN TO SCREEN." 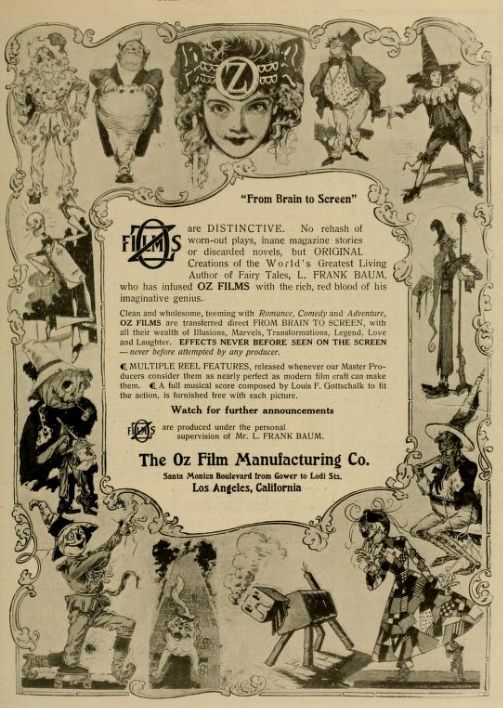 The Oz Film Manufacturing Company, located in Los Angeles, was formed in 1914 to produce movies based on stories by L Frank Baum, the creator of The Wizard of Oz. The company made some movies, but was not a financial success. 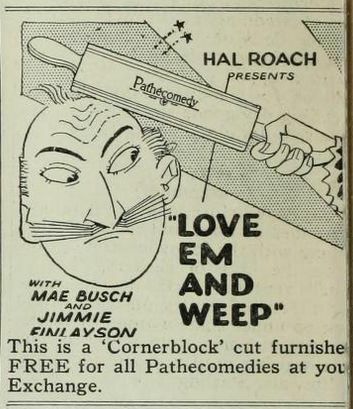 The ad is from the 13-June-1914 edition of Moving Picture World. It's a little small, but I like the images around the edge. Some Oz fan could probably identify the artist. (UPDATE: John R Neill -- thank you, JumpingFrog) Be sure to click on the image to see a larger version. "OZ Films are produced under the personal supervision of Mr. L. FRANK BAUM." 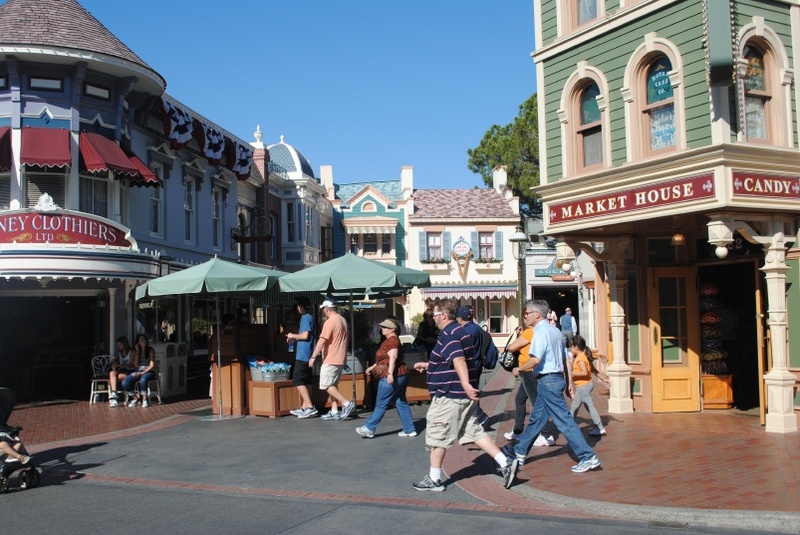 This alley in Disneyland, which branches off from Main Street, probably has a name. I took the photo during our visit in July this year. We went to the Sonoma County Fair in Santa Rosa yesterday. We had not been for many years. We saw the flowers, the animals and the horse races. 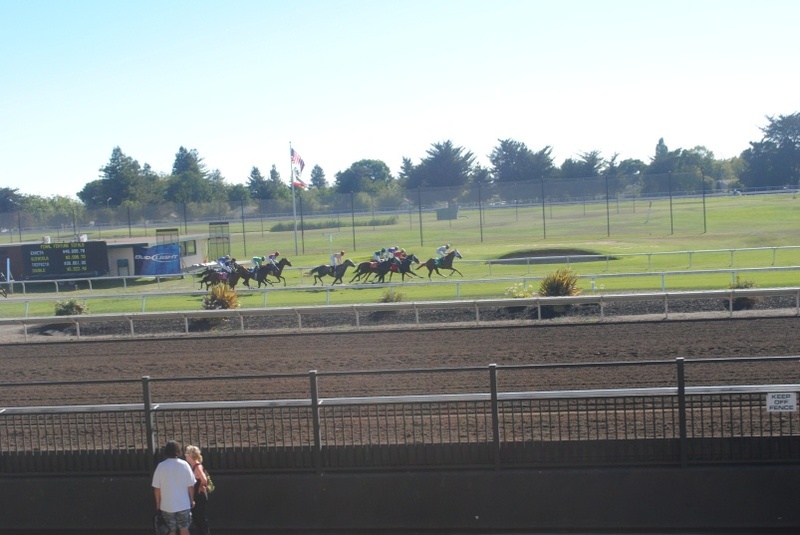 I think this is the exciting conclusion of the 9th race, the Wine Country Debutante. The weather was not as hot as I had expected. Traffic was good going both ways. 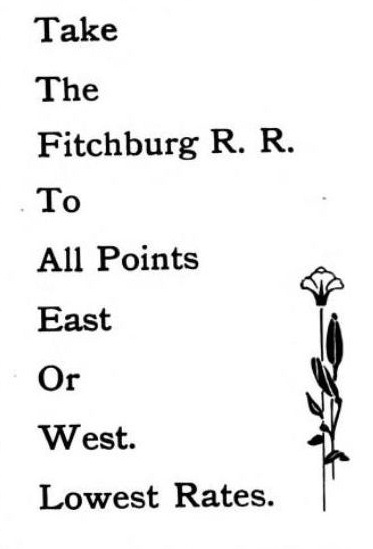 The Fitchburg Railroad ran across Massachusetts and operated the Hoosac Tunnel. I like this ad from Railway Agent, February 1892. The Boston and Maine leased the road 8 years later and merged it into the parent company in 1919. The MBTA operates its Fitchburg line from Boston to Fitchburg. Pan Am Railways operates other surviving sections of the line. This article, from the 01-February-1913 Washington Herald, casts doubts on Jim Thorpe's abilities as a ballplayer. This image is from the 29-May-1912 Tacoma Times. Noted Indian Not Likely to Make Good in Major League Ranks. Jim Thorpe, the Carlisle Indian, who has just been declared a professional by the Amateur Athletic Union is a joke ball player, and if the New York Giants have signed him at a fancy salary somebody has been badly stung. During the season of 1909 five Washington boys played in the Eastern Carolina League and batted against Thorpe. They all state that the Indian was only a fair minor league pitcher, a poor hitter, worse fielder, and that his only asset was speed on the bases, which availed little as he seldom got on the bags. This was four years ago, and possibly the Indian has improved a whole lot since, but the Washington plavers who saw him yn action all tell the same story. They do not think he will ever be able to hold a job in the big show. The records of Thorpe s work down in the Carolina circuit are not startling, and would seem to bear out the opinions our young men in Washington have of the Indian's ability. lost. In the other contests he played first base. The Washington plavers who were in the Eastern Carolina League during the 1909 season are Jack Spalding, Heinie Gastmejer, Cy Macdonald, Curly Brown, and Al Handiboe. They will bear out the truth of the foregoing statement. The writer knew of Thorpe's playing professional baseball three vears ago and could have made the whole matter public had he so desired. So could have countless other baseball scribes, but what was the use. The records of the great Indian were published in Spalding's record books of 1909 and 1910, and it was up to the A.A.U. to do the probing. Thorpe played under his own name and never made any attempt to conceal the fact that he plaved baseball in professional ranks. Thorpe mav turn out to be a great ball plaver but if he does, there will be five Washingtonians greatly surprised. 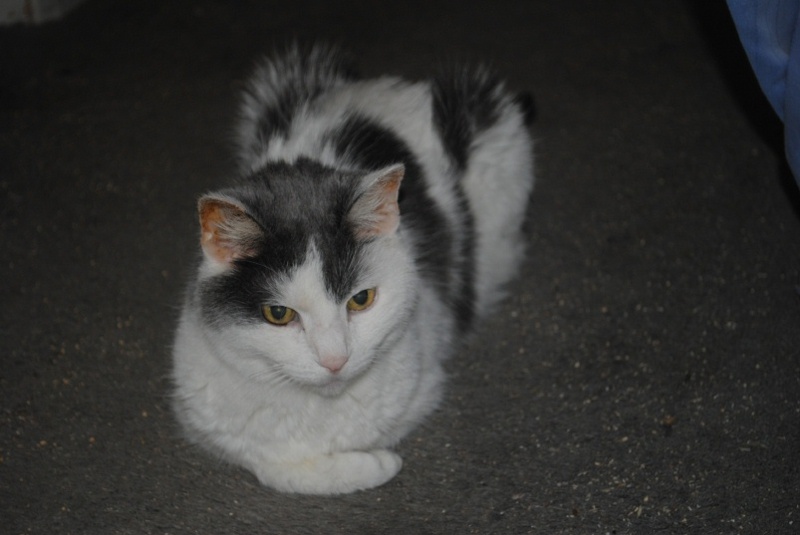 Doctor Peter Henri Van Der Weyde wrote the series of articles which gave this blog its name. His obituary appeared in the 30-March-1895 edition of Scientific American. DR. P. H. VANDER WEYDE. Dr. Vander Weyde was born in Nymegen, Holland, in 1813, a country to which his family, originally German, emigrated at the time of the Reformation. He studied at Durpldorf and was graduated from the Royal Academy at Delft. He was early known as a scientific teacher, writer and lecturer, his first appearance in the latter capacity having been made at Bois-le-Duc in 1833, when he delivered a lecture on acoustics before the philosophical society of that place. Subsequently he was appointed to the chair of mathematics and natural philosophy at the Government School of Design. In 1842 he established a journal devoted to mathematics and physics, and three years later was awarded a gold medal by the Society for the Promotion of Scientific Kuowledge for a text book on natural philosophy. At the same period, he was editor of a political journal which vigorously waged war against government abuses. In 1849 he came to New York, bringing with him a valuable historical collection of philosophical apparatus which he had been forming for some time. He then turned his attention to medicine, and after studying at the College of Physicians and Surgeons and the New York University Medical College, was graduated from the latter institution in 1857. Directly after his graduation, he was appointed professor of chemistry in the New York Medical College; was also appointed physician to the Northwestern Dispensary, and practiced medicine in several parts of the city until 1859, when he relinquished his profession to occupy the chair of physics, chemistry, and the higher mathematics at the Cooper Institute. In 1864, the chair of industrial chemistry was expressly created for him at Girard College. Resigning this professorship two years later, he returned to this city, and devoted himself to scientific writing and experimentation. In or about 1869, he constructed, after wood cuts published in a German periodical, a telephone transmitter that had been invented by the German schoolmaster Philip Reis. This apparatus, the first seen in this country, is illustrated and described in the Scientific American for May 29, 1886. The original instrument of Reis had no adjusting screws, so that its operation was uncertain. Having provided these and made certain other improvements, the instrument worked very satisfactorily. Not so with the receiver, with which be first had considerable trouble, but of which he succeeded in remedying the defects by abandoning the principle of Reis and substituting the intermittent magnetization of an iron bar for the intermittent elongation of iron needles. This resulted in the production of a receiver which worked perfectly. Dr. Vander Weyde was not content to rest with the instruments of these types only, but a year or so later, in 1870, made a form in which there was a horseshoe magnet mounted back of and facing the plate armature. It was simply a powerful electromagnet receiver, something like, but immeasurably superior to, the instruments shown in the Bell patent of six years later. In 1869, Dr. Vander Weyde accepted the editorship of the Manufacturer and Builder, a scientific journal of this city. During his long connection therewith his pen was very active, and his contributions to the scientific press and especially to this journal were numerous. 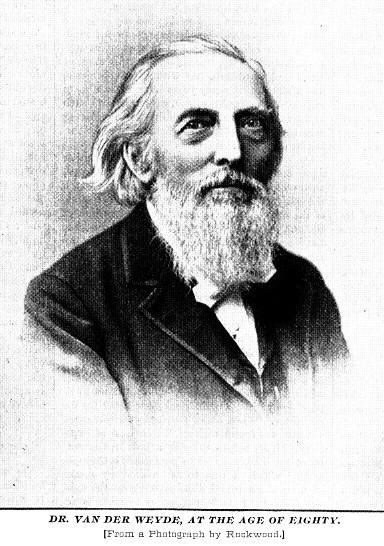 He was one of the editors of Appleton's New American Cyclopedia and contributed many scientific articles to that work. As an inventor he had a wide reputation, the number of patents taken by him on inventions of his own, mostly pertaining to electricity, being more than two hundred. Dr. Vander Weyde, who claimed descent from Walther von der Vogelweide, the celebrated minnesinger of thethirteenth century, was also an accomplished musician and well known as a composer, the number of his compositions amounting to more than three hundred. He was corresponding member of numerous scientific societies in Europe and America. Notwithstanding his advanced age, he enjoyed vigorous bodily and mental health up to the time of his death, within a week of which event he wrote and completed an article upon modern electricity for a scientific journal of this city. 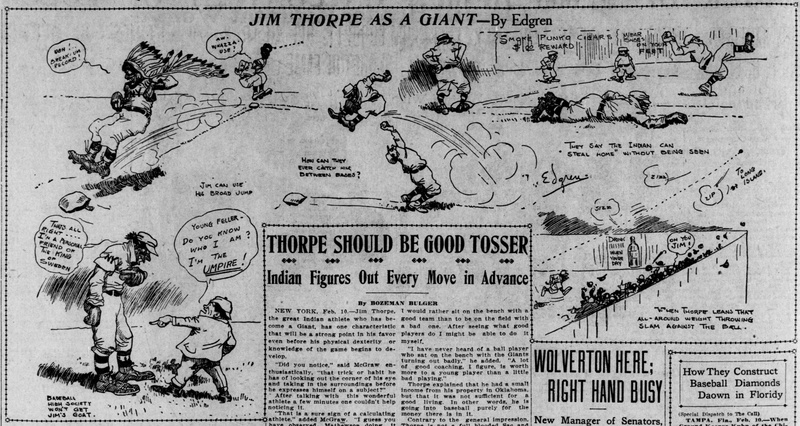 This cartoon by Robert W Edgren, from the 11-February-1913 San Francisco Call talks about Jim Thorpe's career with the New York Giants. Manager John McGraw predicts that he will be a regular this season. Christy Mathewson was a great Giants pitcher. Be sure to click on the image to see a larger version. Please excuse the 1913 racism. NEW YORK, Feb. 10. —Jim Thorpe, the great Indian athlete who has become a Giant, has one characteristic that will be a strong point in his favor even before his physical dexterity or knowledge of the game begins to develop. "Did you notice," said McGraw enthusiastically, "that trick or habit he has of looking out the corner of his eye and taking in the surroundings before he expresses himself on a subject?" After talking with this wonderful athlete a few minutes one couldn't help noticing it. when apparently he was paying no attention." According to McGraw, the ball player who studies out details is nearly always successful. That Thorpe is an observant fellow was shown when I asked him why he preferred to join the Giants. He glanced out of the corner of his eye at a large framed picture of the New York team which included all the substitutes last spring. "I could have gone to St. Louis and, according to what the scout told me, could have been a regular." he said. "But it occurred to me that I had never seen any startling newspaper stories about what the St. Louis team had done. That is what decided me in favor of the Giants. If the St. Louis club was willing to put an untried man like me on the regular team they would likely put other untried men on it and it wouldn't be much of a team. I think I would rather sit on the bench with a good team than to be on the field with a bad one. After seeing what good players do I might be able to do it myself. "I have never heard of a ball player who sat on the bench with the Giants turning out badly," he added. "A lot of good coaching, I figure, is worth more to a young player than a little bad playing." 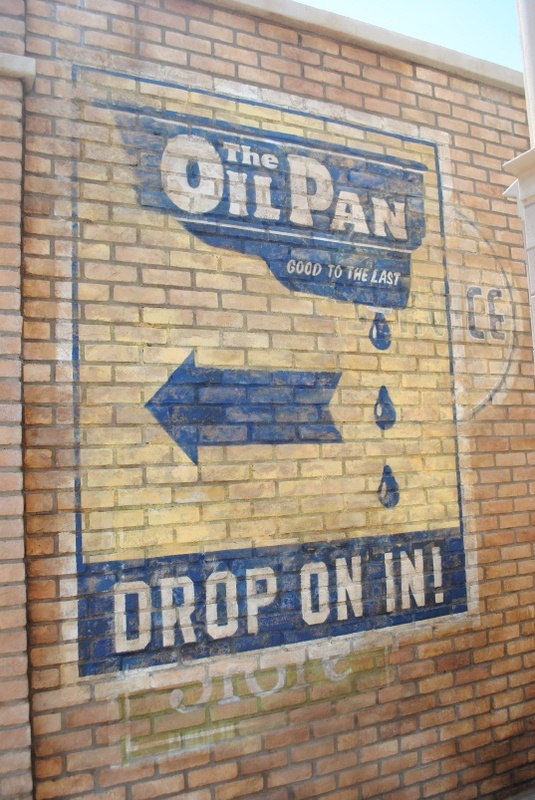 Thorpe explained that he had a small income from his property in Oklahoma, but that it was not sufficient for a good living. In other words, he is going into baseball purely for the money there is in it. Contrary to the general impression, Thorpe is not a full blooded Sac and Fox Indian. His parents are both half breeds. His father is a well to do farmer in what was formerly Indian Territory. Jim was born near a little place called Prague. He is a ward of the United States government and owns a tract of land which is a part of the grant to the Indians. Though there is a general impressionthat McGraw signed Thorpe purely for the sake of having a worldwide famous attraction for the Giants, the New York manager is really enthusiastic over his chances as a player. "Thorpe is the ideal build for a ball player," says McGraw. "He is broad shouldered, clean limbed and. weighs 176 pounds. His mind is quick and his record is ample evidence of his gameness. I like the way he has of studying things out. Of course. I realize that he will be a big novelty for the public, but I also expect to turn him into a good player." In 2012, Disney California Adventure introduced a Red Car line that runs from the main gate to the Tower of Terror, with stops at Carthay Circle and Hollywood Boulevard. I saw two cars, 623 in an older Pacific Electric livery, and 717, painted like a PE Hollywood car. The cars are double ended. The terminals are stub ended. There is a passing track on Hollywood Boulevard, closer to the outer terminal than the inner. 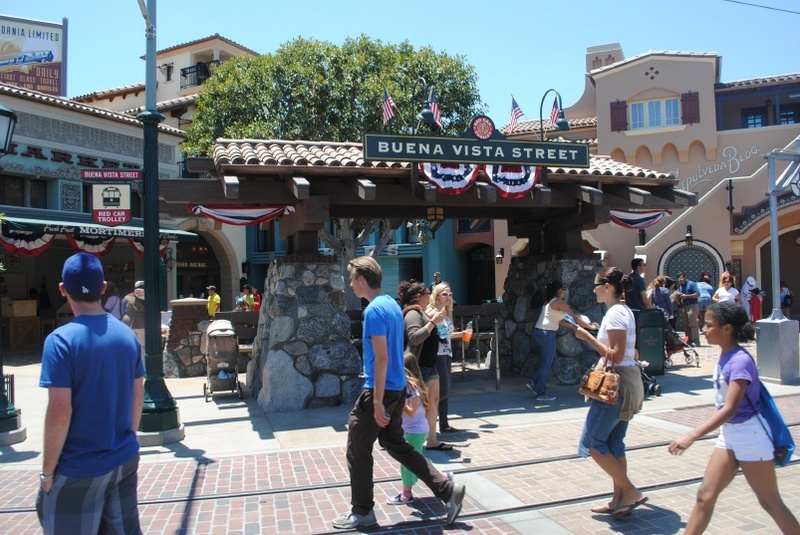 Here is the Buena Vista Street Station, near the main gate. I took the photo during this year's visit. 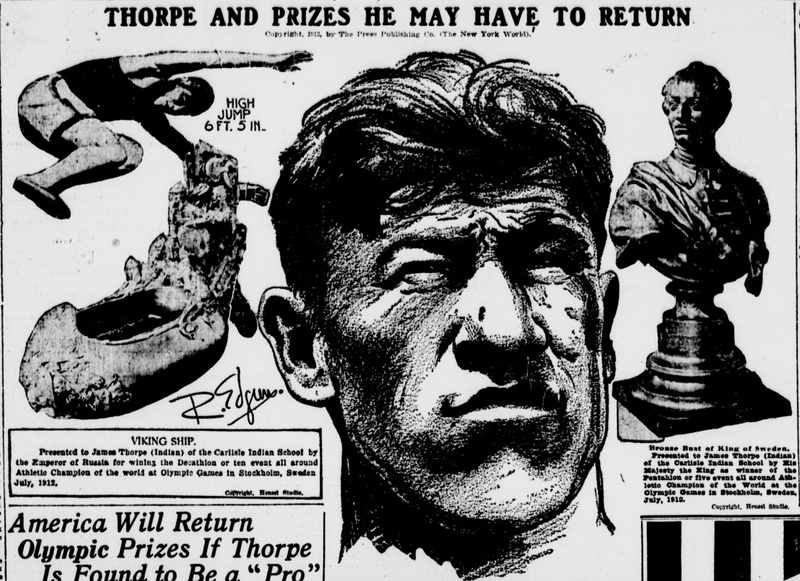 This image, from the 28-January-1913 New York World, describes how Jim Thorpe's brief career in semi-pro baseball threatened his Olympic records. America Will Return Olympic Prizes If Thorpe Is Found to Be a "Pro"
Charges That Indian All-Round Champion Played Professional Baseball Are Being Investigated by the A A. U. After rising to the highest pinnacle in sports ever held by any one in this country, James Tliorpe, world's greatest athlete, now at the height of his fame, must stand trial to answer charges that he blotted his amateur standing by playng professlonal baseball in the Eastern North Carolina League before entering Carlisle. This country will he a heavy loser if the professionalism charges are proven, for not only must the trophies Thorpe won at the Olympic games at Siweden, emblematic of the highest individual score be returned but some of the best records ever made in this country must be wiped off the record book. James E. Sullivan. secretary of the Amateur Athletic Union, said to-day that the National Registration Committee would take up the charges of professionalism against James Thorpe, the Carlisle Indian, to-morrow afternoon. Should Thorpe ultimately be found guilty of professionalism and of having received money to play baseball in the Eastern North Carolina League, in which it is charged he pitched and covered flrst base, America will have to return to Sweden the trophies the Indian won at the Olympic games. While the deduction of his points would affect America's total to some extent, it would not change the result. INDIAN A WONDER AT ALL KINDS OF SPORTS. No one either in this country or abroad has won more notoriety in the sporting world the last two years than James Thorpe, a student In the Government's school at Carlisle. There wasn't a sport that the Indian was not adept in, and his rise to th title of the world's greatest athlete at the recent Olympic games at Sweden was the result of a meteoric career. Thorpe first became heard of as a football player. The aggressive game appealed to the Indian's nature, and he waa a terror for all opposing teams. For the last two years he has been ranked as an All-American halfback One instance of his wonderful work on the gridiron was the game with the Army last year The entire Cadet team "played" for the great Carllale half-back, but so elusive was his line running that he crossed the Army's goal line for three touchdowns. Thorpe specialized in drop kicking, and in this branch of the game was second only to Brickley of Harvard in booting the ball over the bars. The Indian tinned his attention to lacrosse after the football season closed and was a wizard in chasing up and down the field with the netted sticks. BIG LEAGUE TEAMS WANTED TO SIGN HIM UP. These sports didn't require so much time that Thorpe couldn't take up athletics. it was tie same old story when the Indian decided to become a runner and weight man -- nobody could beat him. He quickly specialized in the weight-throwing contests and at the tryouts in Cambridge last spring for the American Olympic team soon demonstrated his right to represent Uncle Sam. At the World's Games in Sweden's capital Thorpe was a revelation to the thousands gathered from many countries. The Indian was in his element in the Pentathlon and Decathalon. Against the strongest array ever brought together for any event the American fought his way to the front in both contests. In the Pentathlon he romped away with 7 points and in the Decathalon Thorpe amassed a total of 8,412.55 points. "You are the greatest athlete in the world," declared the King of Sweden in presenting to Thorpe at the finish of the games two handsome trophies in recognition of his record-breaking achievements. are five men here who played with the Indian while he was a member of the Rocky Mount and later of of the Faytteville team, managed by Clancy, the man who instigated the charges against Thorpe. The town of Radiator Springs is the center of the new Cars Land in Disney California Adventure. This structure, behind the statue of town founder Stanley, houses the traffic courts, the fire department, and the sheriff. Red the Fire Truck moves around Cars Land. Cars Land was fun. I particularly enjoyed Luigi's Flying Tires. I took the photo during our July visit. 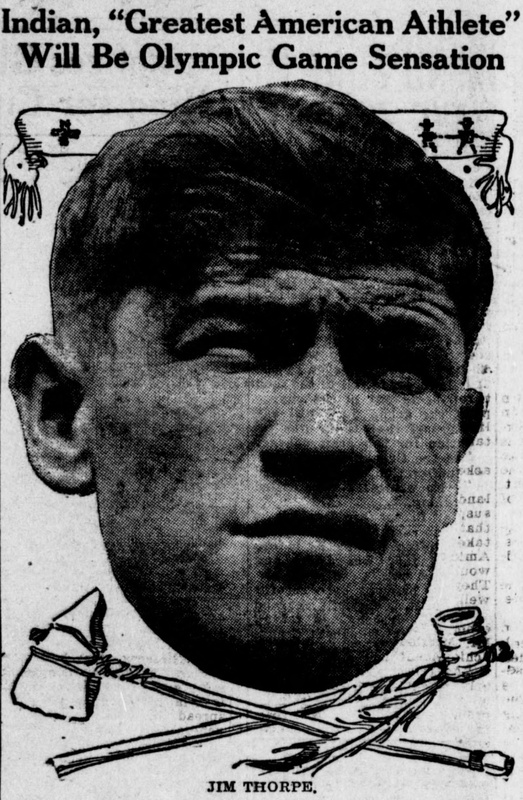 This image, from the 27-July-1912 El Paso Herald, describes Jim Thorpe's wins in the pentathalon and decathalon. In 1913, the Olympic Committee stripped the medals from him because he had been paid to play a few semipro baseball games. Jim Thorpe, the full-blooded Sac and Fox Indian, of the Carlisle Pa. Indian training college, who proved himself to be one of the greatest athletes the world ever saw by winning two all around athletic competitions at the International Olympic athletic games, just concluded at Stockholm. Sweden. At the left, Thorpe is shown just after throwing the discus. In the center he is set for a 100-meters dash. At the right he is shown going over the bar in the high jump. From the 28-February-1909 Pensacola Journal. Zaino a midget and known as the smallest magician in the world. He must be seen to be appreciated and there is no doubt after the first night the Bijou will be packed with those eager to see the little fellow perform. Another star attraction on the bill is Mr and Mrs Deagan in Dutch comedy. 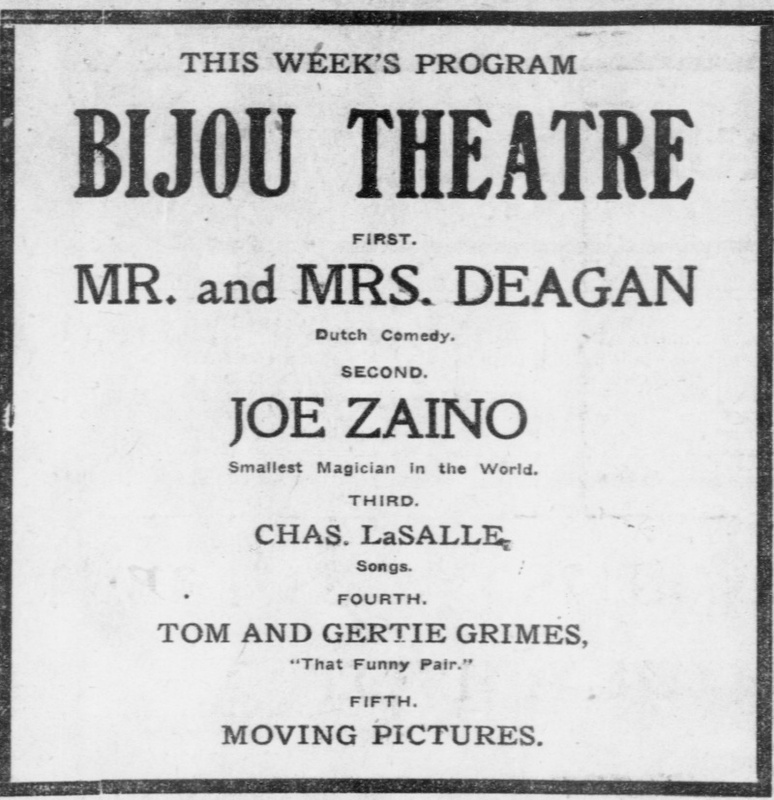 They are high class performers and will cause many a laugh at the Bijou during the week The management desires to impress upon the public that the afternoons will be devoted exclusively to the high class moving pictures. This article, from the 29-May-1912 Tacoma Times, looks forward to the Olympic games and predicts that Jim Thorpe will do well. Most spectacular of the American series in this year's Olympic games at Stockholm is marvelous Jim Thorpe, the Sac and Fox Indian athlete of the Carlisle school, who won the eastern trials. He has been called "the greatest American athlete." As Martin Sheridan will confine himself to the discus events, Thorpe is expected to win honors which have been won in the past by our greatest point-winner. Strong rivals to Thorpe are Donahue, the coast marvel, and August Menaul of Chicago university. Thorpe has shown astonishing form this spring. He is tossing the 16-pound shot well over 43 feet, clearing the bar in the high jump close to 6 feet and doing 22 feet or better in the broad jump. He can step a hundred yards in 10 1-5 seconds and the 220 hurdles close to standard time, while he is one of the best hammer and discus throwers we have. Thorpe has shown exceptional skill with the javelin, is at home in the pole-vault and has the hereditary ability of his race as a runner, so will be very much at home in the 1,500 meter run. This Dominator Brand tomato crate label features an attacking fighter plane. From the general shape and the fire flaring from the propellor hub, I guess it is supposed to be a Bell P-39 Airacobra. It was part of a new display of fruit crate labels which we saw when we visited the California State Railroad Museum in July. I was sad to learn that Gore Vidal had died. He had a gift with words, and wasn't afraid to criticize people for abusing them. 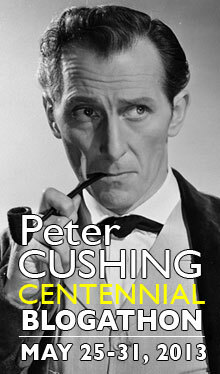 I avoided his historical novels. They would get me upset. Of course, that was part of the purpose.